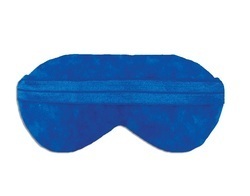 Size: 7.5" x 3.5" x 0.75"
Flamingo Hot n Cold Eyes MaskPromotes restful sleep. - Ultra comfort fit design. Ideal for Home and travel. - Encourages a restful sleep and leaves you and your eyes feeling refreshed and stress free. - Completely Blocks out Ambient light without touching your eyes. Eye masks are soft pads made of cloth/fibre/cellulose/plastic. They are very effective in providing instant cooling and relaxing effect to eyes. They can be used hot and cold depending upon requirements. Eye masks can be made in different colours and sizes according to customer’s requirement. We are actively engaged in proffering working array of Velvet Touch Eye Mask. They are available in many design and sizes. A beautiful range of Eye Masks are available for use at parties. You can also purchase matching Invitation cards, Caps, Birthday Banners and Balloons.